That this is an ACTING CLASS. I ask how many of you have been in plays. 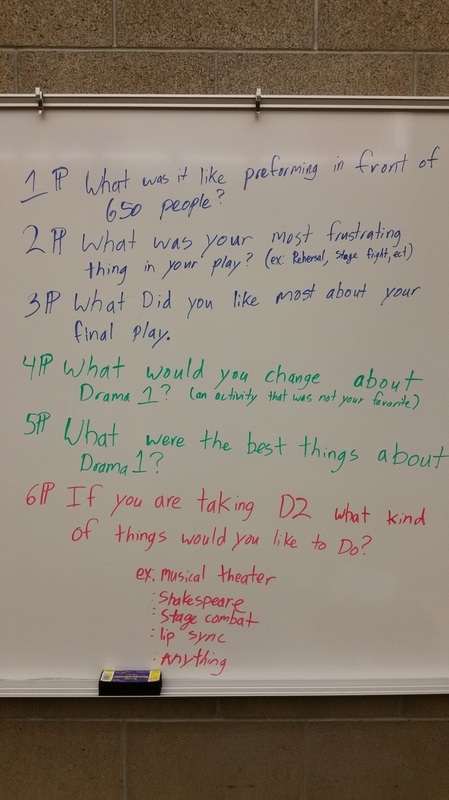 What performances we do in Drama 1. How I get your attention. This class is less like school and more like a job. You will need a composition notebook that is left in the classroom. We go over all disclosure documents and class procedures. Preparation - In class we will fill out the About Me pages. They should have personality so please be creative. Audience behavior that is expected. The first box on the comic strip is to establish the setting. There should be not talking in this box. Like showing it is taking place in a mall, or at night, or in the kitchen. The second is to demonstrate Scene 1, third box is for Scene 2 and so on. The last box is to show the ending pose of their scene. Like a girl leaning her head on the boys shoulder, or a cowboy riding off into the sunset. You also must use pencil the first time you draw the comic strip. What play your piece is from. *Because of copy writes I can not post these scripts on line. Each students receives one script and must return it to me at the end of the unit. Taking care of their scripts is worth 35 points. Acting Final: Part of the State Core is to perform in front of a live audience. 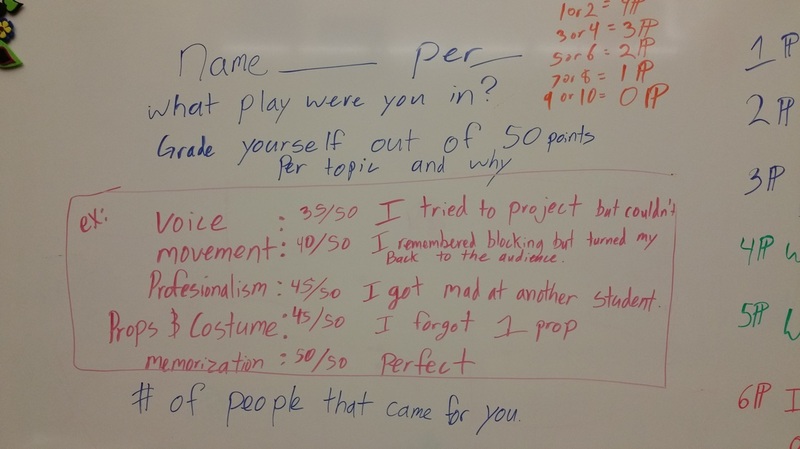 Because of this the Students Must Be At their live after school performance to pass all Learning Targets for drama. It is worth 200 points a performance. One Performance is the in school performance during there class the same day they perform their after school performance. It is not mandatory for the student to bring audience members, however it is encouraged. There is not fee to watch the performances. Just come and enjoy. - Choose your own character. She is intimidating them not just having them "enjoy the show." - "Audience members" are reacting silently. - Everyone is always being seen. - Everyone is enjoying putting on the show. ​- Everyone stays in character. ​*Students should be at school in costume 15 mins before their play. *I will be at the school 30 mins early. anyone that wants to come and get ready at the schools can come up to 30 mins early. *actors - please Do not wear blue jeans. I will be recording the performance and sharing them on this website. The first picture is the first page. The second picture is 2nd and 3rd pages. Make sure you write full paragraphs about each question.